We all know a little staging or sprucing up can go a long way when you’re trying to sell your home. One way to make a big transformation easily is with paint. 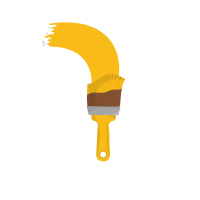 Here are some insider tips on how to use paint to stage a home for selling! 1. Buyers get a feeling as soon as they pull up to the curb.That’s why it’s essential that your house exterior looks its best. Your driveways, walkways and landscaping should be tidy and well-kept. Your front door should be welcoming. Painting your front door an attractive colour takes very little time and provides a budget-friendly update. 2. Focus on high-traffic areas.Paint is one of the least expensive yet highest-impact updates you can make to your home before you list. Focus on first impressions and high-traffic areas, like your foyer and main hallway, kitchen and family rooms. That is, unless you have a “sore-thumb” area to correct, like a sponge-painted bathroom or a meridian blue, hockey-themed bedroom. 3. Buyers don’t want to paint.Contrary to the belief of many sellers, buyers do not want to paint their own colours when they move in. The average Canadian home buyer is looking for a house in move-in condition. 4. Paint on wood.Most Canadians cringe at the idea of painting over natural wood finishes. But if your house has wood floors with matching trim and doors, wood kitchen cabinetry and some wainscoting, you’ve got too much wood going on. Do your buyers and your pocketbook a service by painting your kitchen cupboards and trim. Try a light colour — it will brighten up your home and make it look bigger and newer. You will receive more buyer interest and a higher sale price. Are you wondering if your home is worth the hassle? Call me for a Free, No Obligation Pre-Listing Consultation!